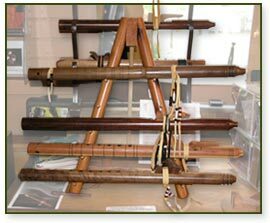 The Native American flute has evolved over the years into a very expressive musical instrument. Crossing all cultural boundaries, modern wood flutes provide a sense of peace to both the player and the listener. This is an instrument you must try — and are guaranteed to love, whether you decide to play or merely to enjoy its sound. The lowest key of a Native American Flute is achieved when all finger holes are completely covered. Different notes are achieved by opening and closing the finger holes in various combinations. Today, the most popular flutes are made in 5 or 6 hole styles. Pinelands always stocks a fine variety of High Spirits and White Dog (made by a local artisan) Native American flutes, in several different woods. Come in and try one for yourself!